The Atlantic Ocean is the home of paradises found, yet left almost intact, by humans. And the 10 islands of Cape Verde fit this description better than any others. Sunny weather, warm African winds, fantastic seafood and melodic morna music make it the perfect place to relax and get in touch with Nature. Boa Vista stunning island is located in the Cape Verde chain and is its easternmost territory. There is no shortage of great views to be seen. There is gorgeous scenery at every turn and the tourist experience at Boa Vista is simply unparalleled. Professional and experienced instructors will guaranty you a great progression during lessons and will get you kiteboarding in short time and with 100% of safety and fun! The school uses the latest 2015/16 kitesurf equipment, with the newest security systems. Every student has helmet, harness, floating vest and wetsuit. Everything is included in the price. Kite school offers kitesurfing courses for all levels, also for children over 10 years old. Beautiful Apartments are located in Sal Rei. All units feature a seating and dining area. Some units include a terrace and/or balcony with sea views. There is also a kitchen, equipped with a refrigerator. There is a private bathroom with a bidet in each unit. Guests can enjoy a drink at the on-site bar. The property also offers grocery delivery. The property has a private beach area and bike hire and car hire are available. This package will suit those who are complete beginners with no kite equipment. The conditions in Boa Vista island are perfect to start kiting. ✔ All units feature a seating and dining area and private entrance. ✔ Some units include a terrace and/or balcony with sea views. ✔ There is also a kitchen, equipped with a refrigerator. ✔ There is a private bathroom with a bidet in each unit. ✔ A great breakfast including breads, cakes, cheese, seasonal fruits and other delicacies of regional cuisine are just some of the items offered to the guests. Other meals are not included in the price. All the instructors speak English, German, Spanish and Portuguese fluently, are highly qualified by IKO and VDWS and have several years experience in teaching of kitesurfing. Professional and experienced instructors will guaranty you a great progression during lessons and will get you kiteboarding in short time and with 100% of safety and fun! The school uses the latest 2015/16 kitesurf equipment, with the newest security systems. Every student has helmet, harness, floating vest and wetsuit. Everything is included in the price. 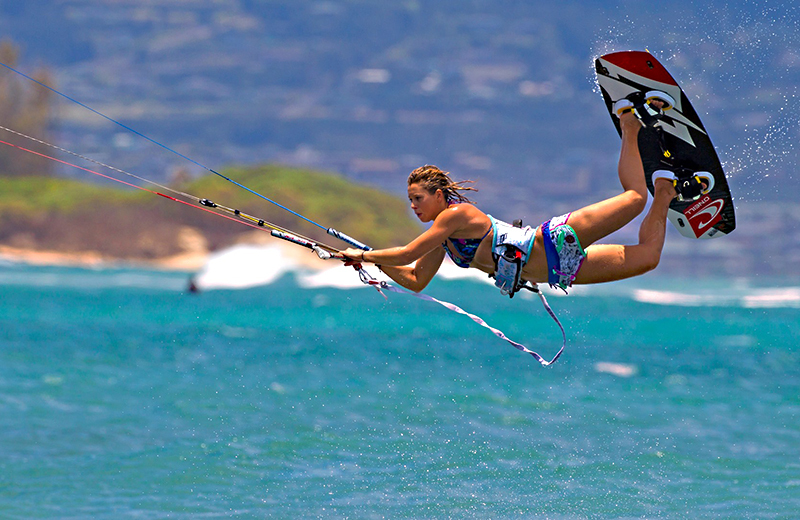 The school offers kitesurfing courses for all levels, also for children over 10 years old. As a safe kitesurfer, you can rent equipment or buy the latest or second hand gear in our Kitesurf School. This kitesurf course is the best option for anyone wanting to completely immerse themselves in the world of kitesurfing! You’ll enjoy the Intro Lesson, and then four more lessons that you can book whenever it suits your schedule. After this course you should be feeling confident to go down to the beach with your own gear, and get out on the water and practice your new sport! Private Kitesurf lessons are the fastest ways to learn. If you would like to fast-track your progression, private tuition is the way to go. We progress you through as quickly as possible whilst making you comfortable with all of the information and equipment, so we teach you from the basics and take it right up to getting you kiteboarding upwind comfortably!. After a couple of private kitesurf lessons the result is guaranteed! Your dedicated kitesurf instructor and you will be able to focus on the areas you need to improve in to help you progress your skills to where you want to be, whether you are totally new to the sport or you are looking to progress to the next level. After each kitesurfing lesson you will be issued an IKO card, which denotes the kitesurfing level you have achieved. These cards becoming ever more important as the sport of kitesurfing grows and many worldwide destinations require you to have one of these cards before you are permitted to kitesurf at the beach. Come October, the winds start blowing on the paradisiac islands of Cape Verde. And, until April, the little archipelago and windsurf fans fall in love. If you’re a pro​, you will enjoy many of our wave spots. Stronger winds and extraordinary clean waves are common around the unprotected coast of the islands, as you’ll see in Funana, a wavespot between the harbour and the offshore island, or in Turtle Bay, a charming place of turquoise water and, yes ­ turtles. If you’re an adventurer​, there are quite few spots just waiting to be discovered not too far from the hotels. Talk to your hosts and they will tell you all you need to know like only a local would. Boa Vista stunning island is located in the Cape Verde chain and is its easternmost territory. There is no shortage of great views to be seen and while the majority of Cape Verde visitors head to Sal, we recommend heading to Boa Vista instead. There is gorgeous scenery at every turn and the tourist experience at Boa Vista is simply unparalleled. The island’s surface area is a mere 600 kilometers and the longest distance from north to south stands at 30 kilometers. Sal Rei is the main town and it is located on the northwest side of the island. The town has all of 3,000 residents to its name. 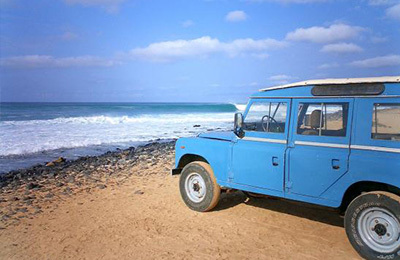 Boa Vista offers a completely different experience from Sal, as Boa Vista maintains its untouched beauty. The area has a very barren appearance and all you’ll see are rocks, at least initially. But these rocks soon give away to a hidden gem and this gem is the reason why we are here in the first place. Simply put, Boa Vista has some of the most beautiful beaches that we have ever had the pleasure of laying our eyes on. These beaches are your reward for spending hour after hour driving an all terrain vehicle down an extremely rocky road. They are comprised of beautiful white sand and some of the bluest water known to man. Perched in the Atlantic, these beaches are responsible for picking up the marauding swells of the ocean. There is an absence of road networks that makes it difficult for travelers to make their way around the island. You’ll need to rent a quad bike or a 4 x 4 in order to navigate the terrain. But, as an added bonus, this makes most of the spots that you will come across fairly empty. You can spend some quality time with the sand and the water, without worrying and simply enjoying this beautiful getaway. The windy season begins in the month of October and can carry on into May or June. During the first few months of the rainy season, only about 50 percent of the days are windy, but this is when the waves also begin to pick up. Windless days are the best time to go surfing and explore the beaches. After the first few months have passed, 90 percent of the days are windy. You must pay for your entry visa on arrival in the Cape Verde Islands. Entry visas can be paid in cash at passport control at a cost of 25€ per person. Starting from 1st May 2013 (due to law 23/8/2012) the government of Cape Verde will charge a Tourist Tax of 220 Cve (2 €) per person and per night, for all persons over 16 years. The hotel acts only as an intermediary in this process. Travelling directly from Europe there are no vaccinations for Cape Verde required for entry. It is a Yellow fever risk region but there have been no cases for many years. Other vaccines need to be considered against food and water borne diseases such as Hepatitis A & Typhoid. With more and more airlines offering direct flights to Boavista from a wide range of Europe cities, traveling by plane has never been easier. Planes arrive on a daily basis at Boavista’s tiny airport. Flying is the most practical way of travelling from island to island however it should be noted that TACV (Cabo Verde Airlines), providing the island’s internal flights, can and do change schedules and flights are sometimes delayed, cancelled or even depart early. For this reason we recommend an overnight stay on Sal or Boa Vista for one night following or prior to an international flight. There is a regular ferry service that operates between São Vicente and Santo Antão. A flight from Europe could get you here in about 6 hours and you’ll want to look into the deals being offered by Thompson and Tuifly. Those who are flying from the UK will appreciate the help they can offer with your excess baggage. Apartment with one bedroom and two sofá bed. Breakfast included. Max 3 persons. Apartment with two bedroom and two sofá bed. Breakfast included. Max 3-4 Persons. "We loved it. First of all, the apartments are situated exactly where they should be between the town and all the cool beaches and beach bars. The hotel itself is everything we could wish for. Great rooms, great views, great people, great service, great drinks at the bar. Thanks to our hosts, for making our holiday great. We want to go back, no doubts." "Great place! My boyfriend and I stayed there for 2 weeks. We are a kitesurf couple, the place is few hundred metres from the beach. Super clean place with very friendly couple owners. Highly recommend it! Cheers from Frans and Carolina." "We have just returned from 2 weeks in Cape Verde & apart/hotel while on Boa Vista. The apartments are spacious, clean & well equipped. The location is perfect, between the beach with watersports such as kiteSurfing, scuba diving, boating etc & the town with a nice selection of restaurants for the evening. The apartments stands out from the rest & we would have no hesitation of recommending & the icing on the cake is the bar offers best gin & tonic cocktail!"